With most comparable kneepads retailing for $70+, the Paragon Kneepads are downright affordable (click to enlarge). 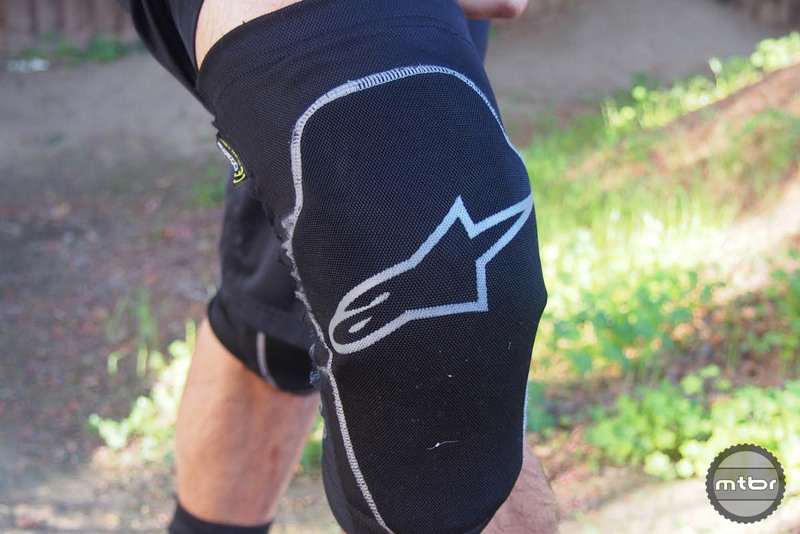 The Alpinestars Paragon Kneepads are among the most comfortable we’ve worn. 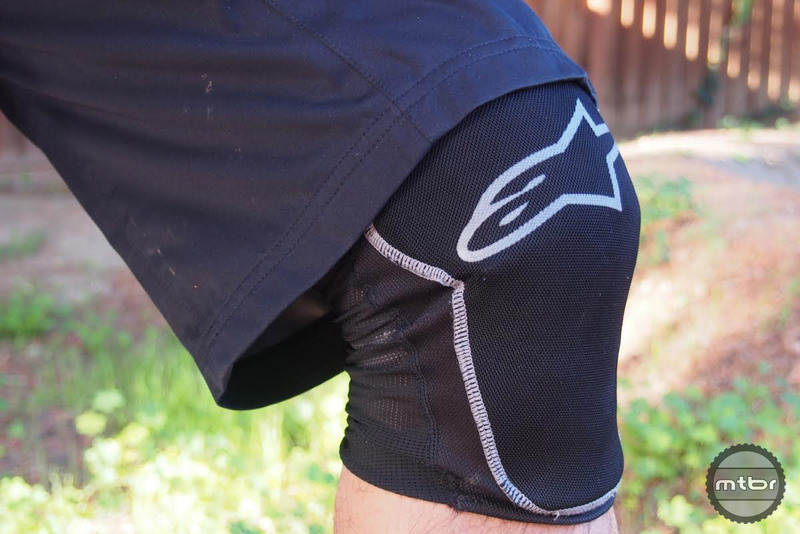 They strike a great balance between protection and light weight, and have become a go-to for even long trail rides. The best part? They cost less than dinner for two. Last night, I went out for a quick dinner at a local taqueria. After beer, guacamole, and super burritos for two, the damage was a shade over forty bucks. Priced at just under the cost of dinner for two, the $40 Alpinestars Paragon kneepads might be one of the most affordable products we reviewed in 2015. The stitching on one test pair frayed slightly, but that did not affect performance (click to enlarge). They’re constructed from a lightweight mesh that has stood up well to long days in the saddle, and the the fabric surrounding the protective padding has withstood a number of crashes without tearing. 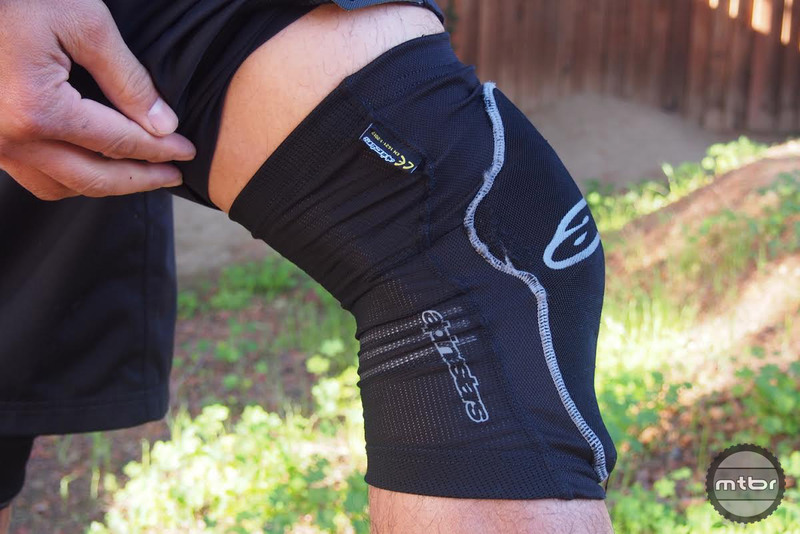 Compared to other lightweight kneepads in the category, what has impressed most is how well they help dissipate impacts. 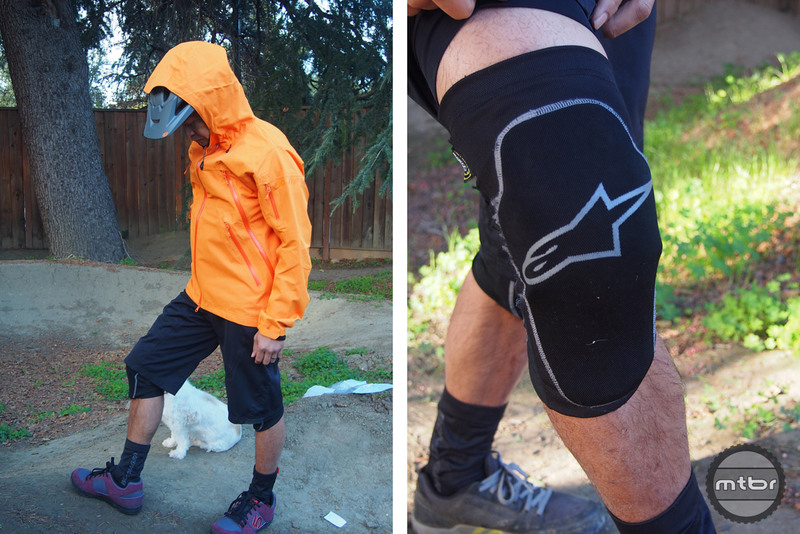 I rarely leave for a ride without wearing kneepads, and over the years I’ve tried a number of different options. In a crash, the majority of these minimalist pads don’t offer significant protection. They may help prevent road rash, but will still leave you bruised up. The Paragon pads are light enough to wear on 25+ mile rides, but also helped me pedal away from some nasty tumbles. I’m convinced I would have had nasty bruising had I been wearing something lighter. Fit is true to size. I normally wear a medium and have not had issues with slipping (click to enlarge). The only thing preventing me from awarding this kneepad a perfect score is that the bottom of protective cup tends to tuck under itself inside the sleeve. It’s a little thing, but when it happens, it makes an otherwise comfortable kneepad not so comfortable. Slim but protective, the Paragons are an office favorite (click to enlarge). Despite the small nitpick, the Alpinestars Paragons are among the most comfortable I’ve worn. If you’re in the market for a small lightweight pad that you can wear anytime, I highly recommend giving them a try. After all, they’ll cost you less than dinner for two. For more information visit www.alpinestars.com. With most comparable kneepads retailing for $70+, the Paragon Kneepads are downright affordable. The stitching on the pair Francis has been wearing have frayed slightly, but this hasn’t affected performance. I have not had any stitching issues with my padset. Fit is true to size. I normally wear a medium and have not had issues with slipping. Slim but protective, the Paragons are an office favorite.